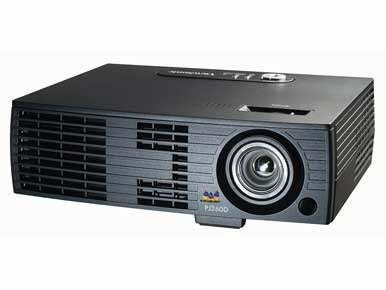 ViewSonic clearly had business presentations in mind when it designed the 2.9-pound PJ260D lamp-based projector. This 1024-by-768-resolution (XGA) ultraportable projector provides most of the basic functions you need for making a presentation in a large conference room. Those features include substantial illumination—2000 lumens of brightness—plus strong contrast, keystone correction (to adjust image distortion caused by tilting the projector), a remote control, and a standard selection of VGA, composite video, and S-Video connection inputs, as well as audio for the built-in, 2.0-watt mono speaker (which is marginally better sounding than the anemic 1.0-watt mono speakers on competing models). Video adapters, such as a DVI-to-VGA or Mini DisplayPort-to-VGA adapters are not included with the projector. ViewSonic throws in a three-year warranty (one year for the lamp), longer than the one- and two-year warranties included with other projectors. Projectors that use default settings optimized for delivering bright, high-contrast presentations tend to make sacrifices in color quality, particularly in accuracy and saturation. In our performance tests, which use default settings, the PJ260D proved to be no exception. While it performed admirably well in displaying sharp lettering in word processing and spreadsheet documents, as well as in PowerPoint slides, its color graphics were a shade less saturated than the images from higher-rated models. For example, the PJ260D’s skin tones in our various photos looked pale. And in a scene from the Speed Racer DVD that’s full of splashy effects, the PJ260D’s hues were less visually striking than what we saw from other projectors that produced more-saturated colors. However, we were able to improve the PJ260D’s color significantly by changing the default display mode (from PC to Movie) and by making other image adjustments. Setting up and using the PJ260D is a little awkward. The power socket is located on the side, which is more unwieldy for cable management than the rear panel (where all of the other connections are located). Underneath, the projector has only two tilt-adjustment feet, rather than the more-common three. This projector’s small set of controls is a bit dodgy to use. Fortunately, the PJ260D’s small remote has easier-to-use buttons for accessing the on-screen display and for making image adjustments. Although the remote lacks a handy hot-button for changing the preset display mode, it does have a laser pointer, often a nice feature for a presenter to have close at hand. Finally, a more-precise user guide with matching explanations for each control button and on-screen menu option would help make the PJ260D easier to work with. If your primary use for a projector is to make presentations, and if you don’t mind running your presentations in 1024-by-768-resolution (to obtain the best image sharpness and clarity) or fiddling with the controls to get the best color, the PJ260D might be for you.